WHAT DOES THE WORLD’S CLEAREST LAKE LOOK LIKE? 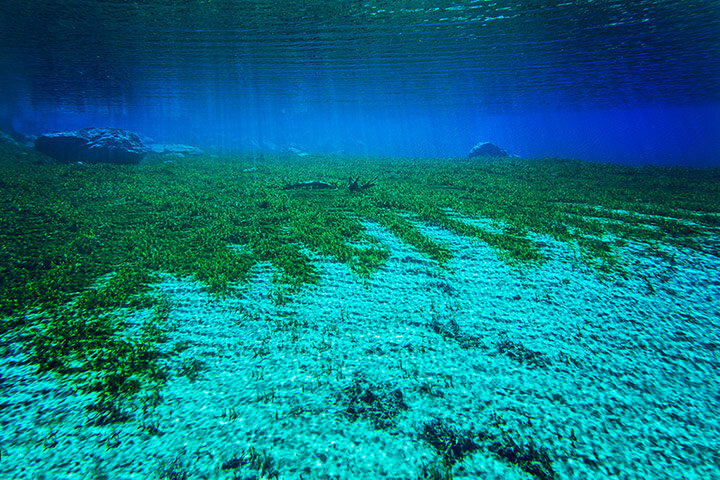 New Zealand’s Blue Lake has the clearest water in the world. “Amazing”, “stunning”, “awesome”, “mind blowing”, are the usual superlatives visitors to Blue Lake use after gazing into its remarkable blue-violet water. “Ethereal” is another word used to describe it. Someone has written “no words” in the comments book in the nearby tramper’s hut. A Japanese couple recorded in the book, “This is a very spiritual place. 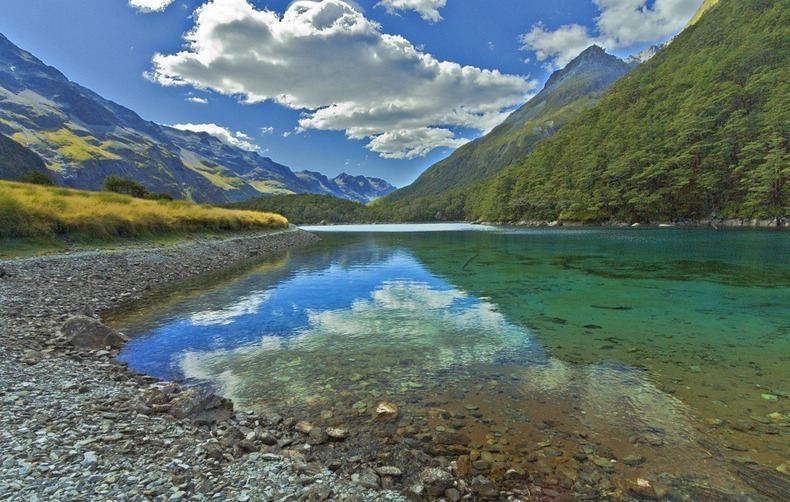 We can feel it.” This remarkable little lake can be found in the 1020 square kilometres (393 sq miles) Nelson Lakes National Park in the upper South Island. Remarkably, it wasn’t until 2001 when Blue Lake was actually brought to the general public’s attention after a hydrologist wrote about the clear water. Even today less that 1000 people actually visit the lake each year. Helicopter rides over the lake have been recently introduced but this only reveals the size of the lake and I don’t imagine the clarity of the water can be observed as successfully as actually standing beside the body of water. I’m safe in saying that most kiwis are unaware of the lake’s existence. The lack of awareness of the world’s purest lake is an indication of just how under explored New Zealand still is. When you realize there are only 4.5 million people rattling around an area the same size, give or take a few miles, as Britain with its 60 million inhabitants, I guess it doesn’t seem so strange. When I mentioned I was writing this blog to friends, they thought I was referring to the small man made Blue Lake in Central Otago. It’s only claim to fame is the nearby famously haunted Vulcan Hotel. I’m not sure why it’s called ‘Blue Lake’ as it actually has cloudy green water, the result of it being contained in a quartz gravel pit created by gold miners in the late 1800s. Getting back to the Nelson Blue Lake. The National Institute of Water and Atmospheric Research (NIWA) undertook a series of studies in 2011and 2012 which revealed Blue Lake to be the clearest body of fresh water on the planet. The visibility in the lake is over 80 metres or 262 feet, making it as clear as distilled water. It is still not known why the water is so clear or why it appears to have no trace of organic matter. The lake is beginning to be featured in international travel guides because of its uniquely beautiful blue-violet shadings seen only in such clear water. Because the lake is located 1200 metres (3937 ft) above sea level, the water fed from nearby Lake Constance is very cold with the temperature hovering around eight degrees centigrade. Blue Lake is regarded as sacred by Maori who have declared it ‘tapu’ meaning it is forbidden to touch the water or swim in it. This is because the lake was once used in Maori ceremonies to cleanse the bones and release the spirits of the dead. They call the lake, Rotomairewhenua which means “the lake of peaceful lands”. ‘Tapu’ roughly translates as “don’t!” Because of this ban, and the fact it involves a two day hike from the entrance to the National Park to reach the lake, it is little known or visited. Some believe a tapu to be a curse but it is really a way for indigenous people to protect the land their way. Generally, a tapu is respected. It’s just a matter of being aware one exists. It is not advised to knowingly break a tapu. There is a 16 bunk serviced hut in the National Park and those wanting to hike to the lake are given warnings about the lake’s special status. I’m sure overseas visitors, once being told about the Maori ‘tapu’ give the lake the utmost respect. In 2013, a Danish environmentalist was given permission from the Maori caretakers of the lake to photograph in the water. His underwater photos reinforce the amazing clarity of the water found here. For the past few years, New Zealand Tourism has promoted the country with the slogan ‘100% Pure’. This has been backed up with images of pristine rivers, lakes and alpine wilderness areas. The reality, however, is a little different with a number of the country’s larger rivers now polluted. Didymo, a particularly invasive algae more commonly called ‘river snot’ because of its revolting, slimy appearance, has been a major problem in the rivers and lakes of the South Island. It became so bad that in 2015, the whole island was declared a ‘controlled area’. A major public awareness campaign was launched to remind all those using the water, to wash boats and equipment after returning to land. It continues to be a major worry and does little to help the ‘100% Pure’ image. Human disregard for the environment has become an issue in the past few years. Runoff of animal waste from farms, especially with the explosion of dairying across the country and the vast increase in the milking cow population, has been a worrying contributor to river pollution. There have also been some factories blamed for tainting a number of rivers that only a decade or so back, were indeed pretty pure. The fight goes on to clean the affected waterways as the government is still committed to presenting New Zealand to the world as ‘100% Pure’. Greate pieces. Keeep writing such kind of info on youir blog. Thanks for your kind comments. I’m pleased you’re liking my blogs. I will endeavour to keep my readers entertained and informed. I’m pleased you’re enjoying my blogs. I will try and keep writing material of interest for everyone. Thanks for the comment. I will try and keep the interesting blogs coming. I plan posting a new one every two to three days. Feel free to share them with your friends. I have learn this post and if I may just I desire to suggest you some attention-grabbing issues or suggestions. Thanks for the comments. I include videos with as many blogs as I can and there are a minimum of 3 images with each blog. Please check some of my other blogs and you will see videos in there. I will try and find material that includes videos as much as possible. Thank you for your time to have put these things together on this blog. John and I very much appreciated your insight through the articles about certain things. I realize that you have a number of demands in your timetable hence the fact that you actually took much time like you did to guide people like us via this article is even highly treasured. Thanks for your comments. I will endeavour to keep writing blogs that will hopefully be of interest to all my readers. Thanks for the comment. Yes, I’d be happy to look at invited blogs. F*ckin? tremendous things here. I’m very glad to read your post. Thank you so much and I’m looking forward to contact you. Will you please drop me a e-mail? wonderful submit, very informative. I wonder why the other specialists of this sector do not understand this. You must proceed with your writing. I’m sure, you’ve a huge readers’ base already! Thanks for the comment. I’m hoping the reader base will grow as I add more blogs every three days. Please tell your friends and I hope you continue to enjoy my material. I try and find interesting subjects to talk about. I’m pleased you like my blogs. Thanks for the comment. I’m pleased you enjoy my blogs. I’ll do my best to keep them interesting. I post a new one every three to four days. enjoyment, as this this web site conations actually nice funny stuff too. it, you’re a great author.I will ensure that I bookmark your blog and will often come back later in life. genuine thoughts on this subject matter. Really.. many thanks for starting this up. Thanks for every other great post. The place else may anyone get that type of info in such an ideal approach of writing? Thanks for another wonderful article. Where else may just anybody get that kind of information in such a perfect method of writing? I’m pleased my blogs are assisting you in your project. Keep checking my site as I publish a new blog every 4 days. Hi, I didn’t know I was on Yahoo News. It must have been achieved by tags I have included with each blog. One must have activated the link to them. Good luck with your attempt to get on their page. I used to be suggested this web site through my cousin. I am not sure whether this post is written by way of him as nobody else realize such detailed approximately my difficulty. If you need a site designed, he is the man! Thanks for recommending my site to your friends. I’ll do my best to keep the interesting blogs coming. Not that I am aware of. i like to provide content that informs and entertains. I hope you keep visiting for the new blogs I publish every four days. A fascinating discussion is definitely worth comment. I think that you should publish more about this subject matter, it might not be a taboo matter but generally people do not talk about such topics. Thanks for sharing your thoughts on World's clearest water. He is quick, very professional and his charges are very reasonable too. He will also answer your questions. mention me, Ceidrik when you contact him. I’m slightly sure I’ll learn many new stuff right here! Thanks for your comment. I will check with my web designer and see if there is something he can do to address the issue you have highlighted. Thanks for that. I am actually thankful to the holder of this web page who has shared this enormous article at here. I’m pleased you like my blogs. I will try and keep them interesting. Thanks for the comment. I don’t know of any other sites that present information as I do. I hope you keep checking my blogs. I publish a new one every three to four days. Hello there, simply was aware of your weblog via Google, and found that it’s really informative. At the moment I am concentrating on subject about New Zealand. I may expand into other areas so keep visiting. I do trust all the ideas you’ve offered to your post. They are very convincing and will definitely work. I post a new blog every three or four days. Hi there mates, fastidious article and fastidious urging commented here, I am really enjoying by these. Thanks for your prediction. I do hope you are correct! Hello to all, how is the whole thing, I think every one is getting more from this web page, and your views are pleasant in favor of new people. book marked to look at new things on your site. I’m pleased you are liking my blogs. I publish a new one every 4 days. Thank you for another fantastic post. The place else may anybody get that kind of info in such an ideal method of writing? I’m pleased you have found my blogs helpful and will be of use to you in your presentation. Good luck. I will be posting a blog on the world’s clearest skies next. Hope you enjoy it. I’m pleased you are finding my blogs informative. I will try and keep them that way. HI sorry to hear you have had hacker problems. I will look into it and chat to my site designer to see if I have backups. Thanks for the remark. Thanks for the comment. I’m pleased you are enjoying my blogs. The layout was done with the help pf my web designer. I wanted to have a site that looked ‘clean’ with no clutter to distract from the actual blog. I’m sorry I don’t know where you can find a captcha plugin as my site was set up by a professional web designed who did all the tech stuff for me. Thanks for the comment. There is not much more I can add on this subject. I did all the research I could and there is really nothing more to add. I was suggested this website by my cousin. You’re wonderful! for audio songs existing at this web page is actually marvelous. you probably did, the net can be much more useful than ever before. Thanks for the comment. I will look into the issue. I’ve had other problems with Internet explorer myself and have changed to Firefox and Chrome. shared across the web. Shame on Google for not positioning this post higher! find out about this topic. You know so much its almost hard to argue with you (not that I personally would want to…HaHa). blogging. I saved it to my bookmark list and will be checking back soon. also pay a visit this web site on regular basis to take updated from most up-to-date information. Thanks for the comment. Pleased you like my blogs. this website on regular basis to get updated from hottest gossip. Fantastic blog! Do you have any hints for aspiring writers? I’m planning to start my own blog soon but I’m a little lost on everything. Would you suggest starting with a free platform like WordPress or go for a paid option? There are so many choices out there that I’m totally confused .. Any suggestions? Many thanks! Hi there, I discovered your site by way of Google while searching for a comparable subject, your website came up, it appears to be like great. I have bookmarked it in my google bookmarks. Glad you like my blogs. I publish a new one every 3 to 4 days. Hi there! Someone in my Facebook group shared this website with us so I came to check it out. I’m definitely enjoying the information. I’m bookmarking and will be tweeting this to my followers! Wonderful blog and fantastic style and design. Thanks for the great comment and for spreading the word. I will try and keep the interesting blogs coming every 3 to 4 days. Thanks for the comment. Glad you like my blogs. hello there and thank you in your information – I’ve definitely picked up anything new from right here. . Make sure you update this once more very soon.. Thanks for your comments. I will look into the issue you brought up. Hi there, I discovered your web site by means of Google at the same time as searching for a related matter, your website came up, it seems good. I have bookmarked it in my google bookmarks. Thank you for sharing superb informations. Your web site is very cool. I am impressed by the details that you have on this web site. It reveals how nicely you understand this subject. Bookmarked this web page, will come back for extra articles. You, my friend, ROCK! I found simply the information I already searched all over the place and simply couldn’t come across. What a perfect web-site. Thanks so much for your kind comments. I’m really pleased you like my writing. The root of your writing while sounding agreeable at first, did not really sit properly with me personally after some time. Somewhere within the paragraphs you were able to make me a believer but only for a while. I nevertheless have a problem with your jumps in assumptions and one would do nicely to help fill in those gaps. In the event you actually can accomplish that, I would surely end up being fascinated. Thanks for the comment. My aim is to keep my blogs sharp and to the point. I am not interested in long descriptions as most people are time starved and don’t have the time to read long articles. I always try and include the important facts needed to make each blog worth reading. Have you ever considered writing an ebook or guest authoring on other blogs? I have a blog based on the same subjects you discuss and would love to have you share some stories/information. I know my visitors would enjoy your work. If you are even remotely interested, feel free to shoot me an email. Thanks for the comment. I try and make my blogs interesting. I hope you keep enjoying them. Thanks. Sorry there was a glitch but taking the time to write is appreciated. F*ckin’ awesome things here. I’m very satisfied to see your article. Thank you so much and i’m having a look forward to contact you. Will you kindly drop me a e-mail? Hmm it appears like your website ate my first comment (it was extremely long) so I guess I’ll just sum it up what I had written and say, I’m thoroughly enjoying your blog. I too am an aspiring blog writer but I’m still new to everything. Do you have any recommendations for inexperienced blog writers? I’d definitely appreciate it. My best advice is to keep writing. The more you write, the easier it becomes and the better you also become. Good luck. Keep me posted. Thanks for the comment. I hope I do become a famous blogger!!! Thank you a lot for sharing this with all of us you actually realize what you are talking about! Bookmarked. Please additionally talk over with my web site =). We could have a link change contract between us! Hi, I don’t have another website, just this blog site. I’m pleased you like the blogs. Hi, Thanks for the comment. yes I seem to be having issues with Internet Explorer but all other browsers all fine. Thanks for your comment. I like to write informative blogs and spend a lot of time researching and getting the facts right. I simply had to say thanks once more. I’m not certain the things I would’ve used in the absence of these smart ideas shown by you on this topic. Entirely was a real intimidating matter in my opinion, but viewing the very specialised approach you treated that took me to leap with delight. I am just grateful for this assistance and thus believe you really know what an amazing job you were carrying out training some other people with the aid of your blog. More than likely you have never encountered all of us. I and also my friends ended up checking the excellent helpful tips on your web page and so before long I got an awful feeling I had not expressed respect to the web site owner for those strategies. These ladies were excited to read through them and already have pretty much been taking advantage of those things. Thank you for indeed being really thoughtful and for utilizing this sort of tremendous tips most people are really needing to know about. Our own sincere regret for not saying thanks to sooner. Virtually all of the things you say happens to be astonishingly accurate and it makes me wonder the reason why I hadn’t looked at this with this light previously. This piece really did switch the light on for me as far as this issue goes. But there is one particular position I am not necessarily too cozy with and while I attempt to reconcile that with the main theme of your position, let me see what all the rest of the subscribers have to say.Well done. Have you ever considered about adding a little bit more than just your articles? I mean, what you say is valuable and all. However think about if you added some great photos or videos to give your posts more, “pop”! Your content is excellent but with pics and clips, this blog could certainly be one of the greatest in its niche. Excellent blog! excellent issues altogether, you simply gained a new reader. What could you suggest about your publish that you made a few days ago? Any sure? What i do not understood is actually how you are not really much more well-liked than you might be right now. You’re so intelligent. You realize thus considerably relating to this subject, produced me personally consider it from a lot of varied angles. Its like women and men aren’t fascinated unless it’s one thing to do with Lady gaga! Your own stuffs outstanding. Always maintain it up! of course like your web-site however you need to test the spelling on quite a few of your posts. Several of them are rife with spelling problems and I find it very bothersome to tell the truth then again I will surely come back again. My spelling is British English, not American English. Spelling of native (Maori) words are correct. Generally I don’t read post on blogs, however I would like to say that this write-up very pressured me to try and do it! Your writing taste has been amazed me. Thanks, quite nice post. Hello there, simply become aware of your weblog via Google, and found that it is truly informative. I am going to watch out for brussels. I’ll appreciate should you continue this in future. A lot of other people can be benefited from your writing. Cheers! My partner and I absolutely love your blog and find many of your post’s to be exactly I’m looking for. can you offer guest writers to write content for you personally? I wouldn’t mind producing a post or elaborating on many of the subjects you write related to here. Again, awesome website! I do consider all of the ideas you’ve introduced for your post. They’re very convincing and will definitely work. Still, the posts are very short for starters. Could you please extend them a bit from next time? Thanks for the post. I keep my blogs ‘tight’ as most people don’t have time to read long blogs. I endeavour to include all the information necessary to provide a good understanding of each subject I write about. Thanks for the comment. I’m pleased my blogs are being useful to you. Thanks for any other informative blog. Where else may I am getting that kind of information written in such an ideal method? I’ve a venture that I’m simply now running on, and I have been at the glance out for such information. My partner and I absolutely love your blog and find almost all of your post’s to be what precisely I’m looking for. Do you offer guest writers to write content for you personally? I wouldn’t mind composing a post or elaborating on a number of the subjects you write in relation to here. Again, awesome site! now, and I in fact like your way of blogging. I saved it to my bookmark website list and shall be checking back shortly. Please take a look at my web page too and tell me what you think. to reddit to share it to others. Very helpful blog. i will follow this blog. continue the nice work. This website is my motivation, very outstanding style and design and best articles. you are in point of fact a good webmaster. The site loading velocity is amazing. It seems that you’re doing any distinctive trick. Moreover, The contents are masterpiece. you have done a magnificent task in this subject! I use GoDaddy and WordPress. holds lots of insightful things. Thanks for the comment. I post a new blog every 4 days. web. I will recommend highly this site! Thanks for the comment. Perhaps I should!! Howdy would you mind letting me know which hosting company you’re utilizing? I’ve loaded your blog in 3 completely different browsers and I must say this blog loads a lot quicker then most. Can you suggest a good internet hosting provider at a honest price? Many thanks, I appreciate it! Hello there, You’ve done a fantastic job. I will certainly digg it and for my part recommend to my friends. I’m sure they will be benefited from this web site. magnificent points altogether, you just won a new reader. What could you suggest in regards to your post that you just made a few days ago? Any positive? Hey There. I found your weblog the usage of msn. That is an extremely neatly written article. I’ll be sure to bookmark it and come back to read more of your useful info. Thank you for the post. I’ll certainly comeback. I’m pleased you liked my blog. Please feel free to check the others in the archive. I publish a new one every 4 days. Usually I don’t read post on blogs, however I would like to say that this write-up very forced me to try and do so! Your writing taste has been surprised me. Thanks, very nice article. Loved your comment. Thanks for that. I’m pleased you like my blog site and blogs! on Google for now not positioning this submit upper! I have written all the information I could find on the subject in the blog. I get the same messages about Explorer issues. I believe it is a problem with that browser. site and in accession capital to say that I get actually loved account your blog posts. now on. I want to encourage one to continue your great writing, have a nice day! What i don’t understood is actually how you’re now not actually a lot more neatly-favored than you may be right now. Hello, I would like to subscribe for this blog to take most up-to-date updates, therefore where can i do it please help out. You can bookmark my site so you get updates. I post a new blog every 4 days. I definitely liked every part of it and i also have you book marked to look at new stuff in your site. regarding my presentation focus, which i am going to deliver in university. I do agree with all the ideas you have offered to your post. They are really convincing and can definitely work. Nonetheless, the posts are too short for beginners. May just you please lengthen them a little from subsequent time? Thanks for the post. I have been exploring for a little bit for any high quality articles or weblog posts on this sort of house . Exploring in Yahoo I finally stumbled upon this site. Reading this info So i am glad to express that I’ve a very excellent uncanny feeling I discovered just what I needed. I so much certainly will make certain to don’t overlook this website and give it a glance on a continuing basis. I’m pleased you like my blogs. I hope you keep enjoying them. Ahaa, its pleasant conversation on the topic of this paragraph at this place at this website, I have read all that, so now me also commenting here. Yes I do have spam issues but have not sorted out a way to stop it yet. Cheers for sharing your blog site. obviously like your web site but you have to check the spelling on quite a few of your posts. Several of them are rife with spelling issues and I find it very bothersome to tell the truth nevertheless I’ll certainly come back again. I use British English. I think you will find my spelling is correct. Hі, I do think this is аn excellent web site. І stumbledupon іt 😉 I mayy return ʏet agaіn since i have book-marked it. rich and continue to guide оther people. For newest information you have to pay a quick visit internet and on web I found this site as a finest web site for most up-to-date updates. kinds of іnformation in quality? I don’t know of any other sites like mine. I post a new blog every 4 days so keep checking in. large amount of work? I’m completely new to operating a blog however I do write in my journal on a daily basis. Thanks for the inquiry. It takes a lot of time to create blogs. Most is in the research and also finding the right subject to write about that will appeal to people across the world. I also like to have some personal experience with the subjects i write about so there is that personal element. I dedicate 4 hours a day in maintaining my blogs. if you feel you can be motivated to constantly publish new blogs, go for it. I’m pleased you like my writing. I get a lot of spam too and don’t know how to overcome it. Sorry I can’t help as I’m trying to find a way to stop it too. I have numerous images in each blog and usually one or two videos too. Thanks for the comment. super fast for me on Safari. Superb Blog! Thanks for the comment. I’m pleased you like the site and its design. My plan all along was to keep it simple and entertaining. Hey there! Do you have Twitter? I’d like to follow you in case that will be okay. I’m undoubtedly enjoying your blog and look ahead to completely new posts. a kind points of views. I agree with a lot. I’ll come back for more great posts. I absolutely love your blog and find most of your post’s to be precisely what I’m looking for. can you offer guest writers to write content for you personally? I wouldn’t mind producing a post or elaborating on a number of the subjects you write related to here. Again, awesome site! Valuable info. Lucky me I discovered your web site by chance, and I am shocked why this accident didn’t took place earlier! I bookmarked it. Hello! I realize this is kind of off-topic however I had to ask. Does running a well-established blog like yours take a large amount of work? I am completely new to blogging however I do write in my diary everyday. I’d like to start a blog so I can easily share my own experience and feelings online. Please let me know if you have any kind of recommendations or tips for brand new aspiring blog owners. Appreciate it! Just have a focus and passion to write and you will be a success. Very good blog you have here but I was wondering if you knew of any discussion boards that cover the same topics discussed in this article? I’d really like to be a part of community where I can get opinions from other knowledgeable people that share the same interest. If you have any recommendations, please let me know. Kudos! I’m not aware of any discussion groups sorry. Pleased you like mu blogs. I’m really enjoying the design and layout of your website. It’s a very easy on the eyes which makes it much more enjoyable for me to come here and visit more often. Excellent work! Excellent blog! Do you have any recommendations for aspiring writers? I’m planning to start my own site soon but I’m a little lost on everything. Would you recommend starting with a free platform like WordPress or go for a paid option? There are so many options out there that I’m completely overwhelmed .. Any ideas? Kudos! Thanks for the comment. I use WordPress and had a web designer set the whole thing up for me as i don’t have tech knowledge. Good luck with your progress. Hello! Someone in my Facebook group shared this site with us so I came to look it over. I’m definitely enjoying the information. I’m book-marking and will be tweeting this to my followers! Great blog and brilliant design. Please let me know if you’re looking for a writer for your site. You have some really good posts and I feel I would be a good asset. If you ever want to take some of the load off, I’d really like to write some articles for your blog in exchange for a link back to mine. Please blast me an e-mail if interested. Thanks! Very good blog! Do you have any tips and hints for aspiring writers? I’m planning to start my own site soon but I’m a little lost on everything. Would you advise starting with a free platform like WordPress or go for a paid option? There are so many options out there that I’m completely confused .. Any ideas? Kudos! I use WordPress and have a designer to set up all the tech stuff for me,. With havin so much content and articles do you ever run into any issues of plagorism or copyright infringement? My website has a lot of exclusive content I’ve either written myself or outsourced but it appears a lot of it is popping it up all over the web without my permission. Do you know any methods to help reduce content from being ripped off? I’d truly appreciate it. I just cross my fingers and hope for the best. After exploring a few of the articles on your web site, I seriously like your technique of blogging. back in the near future. your post is so awesome. Hi! This is my first visit to your blog! We are a team of volunteers and new initiatives in the same niche. Blog gave us useful information.